Last month at Comic-Con in San Diego, the BBC had a panel for their popular television series Sherlock, and though the stars of the series – Benedict Cumberbatch) and Martin Freeman – weren’t there in person, they did send a video message to be shown for the fans. It will be a while before we get new Sherlock episodes, but the BBC just released the first teaser trailer for Season 3. You can watch it here below. If you follow Sherlock, then you know that the famous detective was presumed dead at the end of Season 2 in the episode “The Reichenbach Fall,” so the Season 3 premiere, “The Empty Hearse,” will focus on how Watson (Freeman) is coping with Sherlock’s (Cumberbatch) death and then Sherlock’s return. The other two episodes for the season are called “The Sign of Three” and “His Last Vow” (the original clues for the names were given as “rat, wedding, bow”). Also for Season 3, Lars Mikkelsen, (Hannibal star Mads Mikkelsen’s brother) will play the villain, Charles Augustus Magnussen. 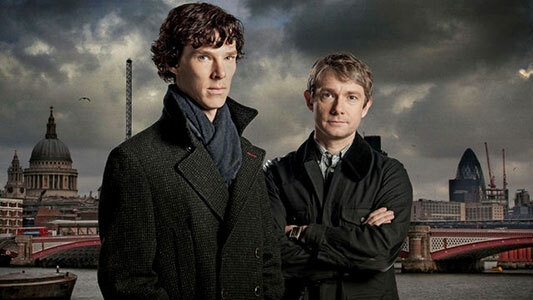 In the U.S., Sherlock will return in 2014 on PBS Masterpiece.